... let me guess... I'm not the only quilt blogger with projects in waiting... I didn't think so. At this time, my baskets are filled with projects that must wait. My sibling and I are in the final planning stages of a big birthday party. My Mom, who lives in Wisconsin, will be 90 years old next week. The hall is rented, the food ordered, the decorations are... getting there. Relatives from as far away as California, Maryland, and Pennsylvania will be joining in on the celebration. I will see uncles, aunts, and cousins...some of whom I haven't seen in 22 years! This isn't a surprise party... Mom was made aware about a week ago of the plans that have secretly been in place for about 8 months. Mom shed a few happy tears when we told her that her only surviving sibling, her brother, is coming from Pennsylvania. And as expected, she is most excited about seeing her four great grandchildren! Oh, and her two grandchildren and their spouses, travelling from Iowa. And her third grandchild, the bachelor of the bunch, will fly in from Colorado. Let the party begin! I'll be taking a few weeks off from blogging, and, most likely, from visiting the world of quilt bloggers. One priority at this time. My Mom. ... paper template diamonds in my case. In the evening hours after long, busy days at work, I enjoy the methodical movement of threading a straw needle and choosing just the right fabric diamond to be next in the row. Tiny stitches secure the 153 diamonds together... eventually another 136 colorful diamonds will join them! I'm thankful for this project and a devotion to hand sewing the diamonds together. The hours that I spend in this task lead me to a restful night of sleep, and prepare me for the busy hours of the next day at work. Missie Carpenter, the designer of the pattern in the above picture, has a wonderful blog where you can find all of her marvelous patterns. Visit Traditional Primitives by clicking here. In years past I have made a Christmas ornament for each of my four grandchildren. My intention is to always start making them in July... I think that may have happened twice in the past ten years! This year I chose a sweet snowman framed face. I purchased a This & That embroidery pattern - Merry Mini's #2. As usual, I'm changing things up a bit by adding some additional stitches, and black beads for the eyes. This snowman is for my youngest granddaughter. The pompom on the hat will be trimmed once the ornament is in a more finished state. I will embellish the ornament with of few of the snowflake buttons. Looking at the picture, I may need to add a few more stitches using purple floss... this little one loves purple! The other snowman ornaments will be done in colors that match the personality of each of the other grand kids. I'm determined to finish these well before the midnight oil must burn! Are you working on anything for Christmas 2013??? My version of the pattern Hint of Fall by Buttermilk Basin is finished! Using fabrics of blue, gold, and creamy beige, I made this mini larger by adding an extra row of the elongated snowball block. I couldn't wait to sew the binding on, wash it, and throw it in the dryer to get that crinkly, used look! I kept the machine quilting simple. I'm pleased! For now this mini will grace the coffee table in my living room, with antique wooden spools resting on it. While quilt shop hopping during last month's retreat, I purchased a half yard of some of the cutest Halloween fabric I've seen in a long time. I wasn't sure what I was going to make, but I knew I had to have it! I ended up cutting the half yard into two fat quarters, backed it with coordinating Halloween fabric, sandwiched thin batting between, and made two table toppers. Using cream colored thread, I machine quilted around the eyes and mouths of the pumpkins, and the inside margins of the pumpkins themselves. Then I outlined the outside margins of the pumpkins and the spaces between them using black thread, to achieve a bit more puffiness. And how about that cute made-from-mason-jar-lids pumpkin! quilt club the other night! Nothing beats a day off from work to attend a quilt show... especially with my sister who travelled from Wisconsin to attend the show with me! After a quick breakfast at Panera, my sis and I dodged raindrops and puddles after parking the car, and rushed through the doors of HyVee Hall in Des Moines. 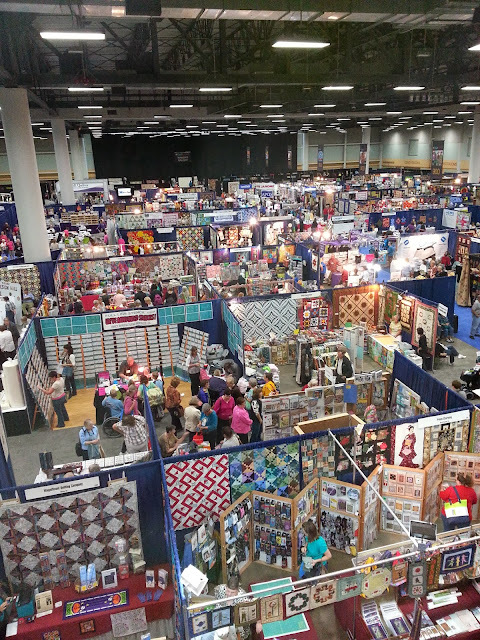 With our best comfy shoes on, and our over sized quilted bags slung over our shoulders, we joined the crowd of other enthusiastic quilters to drool over the beautiful quilts on display, and shop 'til we drop! This not-so-wonderful picture was taken with my phone... I forgot my camera! How did that happen?!?!?! I'm kind of known for having my camera with me at all times. So, no pictures of the marvelous quilts or wonderful vendor booths, many of which do not allow pictures anyway. Mary Jo and I methodically walked up and down the aisles, being careful to prevent any neck pain from quick head snaps, not wanting to miss anything. That wasn't always easy! We made notes of our favorite aisles and booths to visit a second (sometimes a third) time. Halfway through we took a caffeine break, mostly for my benefit. A diet coke later we were recharged to forge on, and not miss a thing! It's easy to say our favorite booth was Primitive Gatherings. Lisa was in between teaching classes, so it was nice to see her among her beautifully displayed quilts and patterns. Visiting with the vendors is so enjoyable! We appreciate them coming to our Midwest town year after year! Check out a few pages from the book, Kindred Spirits - Celebrating Pieces of the Past. Oh my!!! What's not to like??? It was nice to spend time in my sewing room with my sis. It gave her an opportunity to inspect my collection of patterns, snagging a few that I'm sure I'm done with. I sent her home with a large container of flannel and cotton fabrics that she will undoubtedly incorporated into her quilts. None of the fabrics are really old... just some that I've used for past projects. I'm sure the fabric was happy to be going home with her, instead of hanging out in a bin under my cutting table! I gave her a quick lesson on paper pieced foundation, and English Paper Piecing. I warned her about how addicting the EPP can become! In turn, Mary Jo gave me a quick lesson on how she finishes her binding tails, to end up with a nice smooth finish. I needed the lesson... I've struggled for too long on the best way to achieve that smoothness! Mary Jo is on her way back to Wisconsin as I write this. Without question, she will come back for next years AQS show... or, I just may have her seek out a quilt show taking place in my home state, and I'll do the driving next time!